From 1990 to the present, I have completed many private and public commissions. In 2000, I unveiled my first major work: the larger than life-size bronze of D'Artagnan for Xavier University. 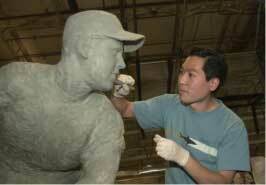 The success of this sculpture led to the commission of the statues of Cincinnati Reds players at Great American Ball Park. These life size bronzes were finished by the summer of 2004. In 2009, I was commissioned to create the "Madden Most Valuable Protectors Award", the trophy that is annually given to the National Football League's best offensive line. During the week leading up to Super Bowl XLIV, the New Orleans Saints became the first recipient of the trophy. I am known for creating sculptures that have a sense of vitality. To achieve this vitality, nature is my main source of inspiration. I abstract from the rich and varied shapes and movement of people and animals. From these abstractions, I develop ideas that enable me to instill that living, breathing quality in my sculptures. And just as living things interact with their environment, my sculptures do the same. Instead of a sculpture that is separate from everyday life and its physical space, my sculptures are woven into peoples' lives and spaces. For instance, my statues at Great American Ball Park, appear to be playing in an imaginary ballgame. This design helps people connect with the sculptures in a exciting way. At every game, kids and adults alike, look, play and pose with the ball playing statues. New materials usually open doors for new kinds of artistic expression. Currently, I am experimenting with a durable laminate material for a public sculpture commission. If this material, originally designed for zero-maintenance architectural cladding, succeeds in my experiment, I plan to use this material's unique properties for a series of new outdoor sculpture. My childhood fascination with Greek art led to my interest in sculpting. While I pursued a B.A. in Classical Civilization from the University of Cincinnati, I apprenticed with the master sculptor Richard J. Miller. This apprenticeship was the most important education of my life. From Miller I learned about many aspects of sculpture from design philosophy to working with bronze, clay, plaster and digital media.